That's when I decided to read Outlander by Diana Gabaldon for the third time. Previously, even though I had thoroughly enjoyed Outlander (here's the book review I wrote on Outlander after reading it the second time), I had a difficult time getting through Dragonfly in Amber, and don't even think I made it through the first few chapters of Voyager. What's worse, is that I don't even remember exactly why I gave up on the series. Considering Gabaldon's tomes are quite long, I'm betting I became impatient with her minute details. In any case, I hoped perhaps the television series would open up my eyes to some element I may have missed before, whether it was appreciating the historical accuracy of the series, or becoming more familiar with the novel's setting on the big screen. I also wanted to see the character's faces in the flesh, and experience the chemistry between Claire and Jamie, Claire and Frank, and Jamie and Jonathan. Thankfully, my plan has worked, and I've already dived into Dragonfly in Amber with aplomb. I'm hoping my renewed interested in the books will allow me to appreciate the rest of the series in full! 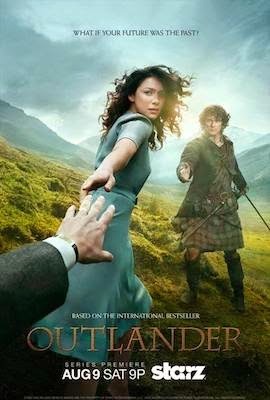 If you're reading this post and feel the same way about the Outlander series after having watched the television series on Starz, leave a comment and share your own thoughts! I know most people either love or hate this novel, so I'm curious as to whether the television series has sparked renewed interest in old fans like it did in me.